The Standish Sanitarium and its owner, lovely Judy Standish (Maureen O'Sullivan) are in deep financial trouble. Judy faces liquidation, bankruptcy, and the sale of the institution. One of the rich patients, hypochondriac/socialite Mrs. Emily Upjohn (Margaret Dumont) is about to leave the hospital, because the doctors can find nothing wrong with her. She is indignant and on the verge of a nervous collapse. When Judy tells her fiancee, handsome Gil Stewart (Allan Jones) that she is upset about losing the hospital and their wealthy patient Mrs. Upjohn, he produces papers to show he has just purchased a race horse named Hi-Hat for $1,500 with the last of their money. He foolishly hopes to gamble with the racehorse to win money to save their situation. Judy thinks he will "gamble away" their happiness on a longshot. As Mrs. Upjohn leaves the sanitarium, she expresses her need for a doctor who can support her hypochondria: "I'm going to someone who understands me, I'm going to Dr. Hackenbush!...Why, I didn't know there was a thing the matter with me until I met him!" Tony (Chico Marx), Judy's friend and sanitarium chauffeur, realizes that Upjohn's financial support can rescue the hospital. He informs Mrs. Upjohn that the same Dr. Hugo Z. Hackenbush (Groucho Marx) of Palmville, Florida is arriving - but Hackenbush is a horse doctor veterinarian, not a human doctor. Tony's plan is to make Hackenbush chief of staff, therefore persuading Mrs. Upjohn (with her romantic attachment to him) to remain and to loan the sanitarium money to keep it from closing down. Judy has no choice but to go along with the plan. Tony doesn't know who Hackenbush is, but declares: "If she wants a Hackenabuss, she's gonna get a Hackenabuss." Dr. Hackenbush receives Tony's telegram at his sanitarium for small animals and horses, offering to have him come up and take care of the Standish Sanitarium and Mrs. Upjohn. Then he remembers her: "Ah, Emily, she never forgot that hayride." He leaves his veterinary practice, and gives one last pill to an ailing horse: "Take one of those every half mile and call me if there's any change." A takeover is planned by evil Mr. Morgan (Douglas Dumbrille), the owner of the nearby racetrack and hotel, with his accomplice Whitmore (Leonard Ceeley). Morgan confronts Judy with a final offer - give up the sanitarium immediately and receive a $5,000 payment, or wait one more month until the mortgage forecloses and receive nothing. Just then, an excited Mrs. Upjohn arrives with the gleeful news that Dr. Hackenbush has arrived, and she is willing to support the sanitarium in any way she can at least for the next month. This is Mr. Whitmore, our business manager. Hackenbush (apologizing): Oh, I'm terribly sorry. Here's a quarter. Hackenbush (following their example): Dodge Brothers, late '29'. Hackenbush describes his education, background and experience. Hackenbush: At the age of fifteen I got a job in a drugstore filling prescriptions. Whitmore (skeptically): Don't you have to be twenty-one to fill prescriptions? Hackenbush: Well, uh, that's for grown-ups. I just fill them for children. Hackenbush: Oh, well, uh, to begin with I took four years at Vassar. Mrs. Upjohn: Vassar? But that's a girls' college. Hackenbush: I found that out the third year. I'd've been there yet, but I went out for the swimming team. Whitmore: Ah, and what happened? Hackenbush: I got the flu. Whitmore: That looks like a horse pill to me. Hackenbush: Oh, you've taken them before? (To Mrs. Upjohn) You have nothing to worry about. The last patient I gave one of those to won the Kentucky Derby. Whitmore (after examining the large pill): Isn't it awfully large for a pill? Hackenbush: Say, you're awfully large for a pill yourself. With the sound of a racetrack bugle, Hackenbush departs. 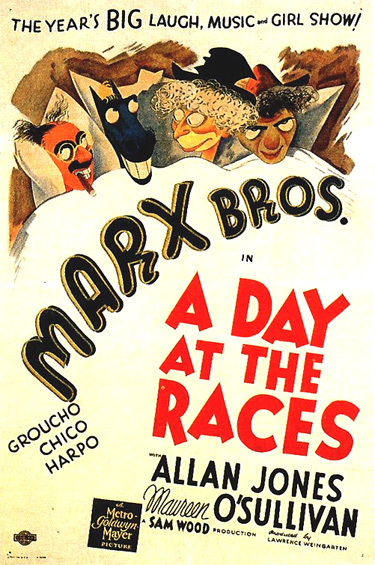 At the races, Stuffy (Harpo Marx), Morgan's horse jockey, wins a race he was supposed to lose. He hides in Hi-Hat's stable to avoid being beaten. He tells Tony, who is also a racetrack ice-cream vendor when he isn't chauffeuring for Judy, that he has been fired, signaling the firing by striking a 'fiery' match. Tony suggests to Gil that Stuffy be Hi-Hat's jockey and caretaker, but Gil is out of money. He cannot even afford to pay the feed bill when the sheriff (Robert Middlemass) arrives to collect. In a brilliant sightgag, they transform a $5 dollar bill into $15 in a clever ruse of pickpocketing and prevent the horse from being foreclosed. Stuffy gets caught making his final reach into the sheriff's pocket, and he makes the most of it, taking the sheriff's sock off his leg.